I know I don't need to tell any of you this, but kids grow crazy-fast. They also lose stuff. A lot. So this latest finished project is courtesy of Alex's recent growth and the fact that he lost one of his other mittens. That last bit is also my fault because I thought it wouldn't be a big deal to take those other mittens off of their cord and let him wear them to school (it wasn't quite cold enough for a heavy coat yet). 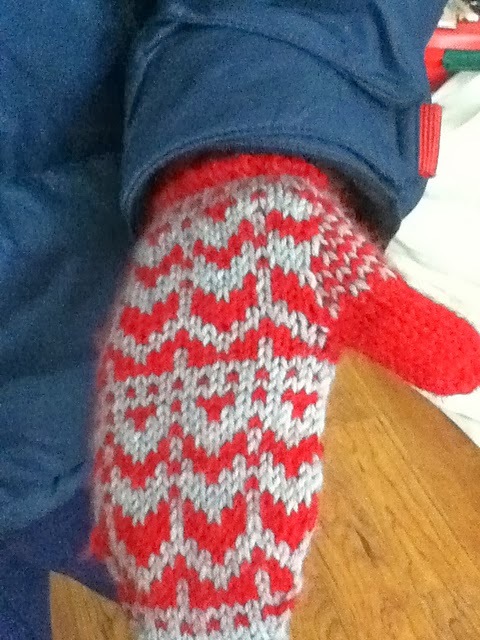 That proved to be folly on my part because one of those mittens didn't ever make it home. And then it got really really cold. 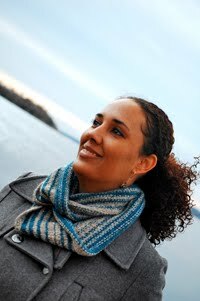 So what is a knitting mom to do when there is a sudden snap of unseasonably cold weather? Knit a new pair. I know the fastest thing would have been to knit a replacement, but I used up the majority of the left-overs from the last pair knitting these and this, so I would have needed to buy a brand new skein. It was easier and more thrifty to simply pull out partial skeins from my stash and knit something brand new. Alex had also said once or twice that his hands were still cold on the bitterly cold mornings walking to school, so I decided that a little colorwork should do the trick. If any of you out there are unfamiliar with stranding or colorwork, the basic principle is like this; for every red stitch you can see, there is a strand of gray yarn behind it that you don't see. Same for the gray stitches. Those little strands (hence the term 'stranded') help block out extra wind and keep body heat inside, and produce an overall thicker and warmer mitten. The days have been a heck of a lot colder than they were at this same time last year and he's been much more comfortable. He's even asked for a matching neckwarmer because his current one isn't warm enough. It's made out of Berroco Comfort because it touches his skin directly and he's very sensitive. If I knit him a matching neck warmer, I'll definitely need to line it so that he can actually stand to use it. And as you can see here, I took the time to attach buttons to the back of the cuff. This is a feature on all of Alex's mittens. That way I can attach them to a cord inside his coat so when he quickly takes his mittens off (and drops them on the floor) they'll just swing from the cord coming out of his sleeves. Having them attached by buttons and loops allows me to wash them while leaving the cord inside the coat. If you've put a cord inside a coat, you know that the cord slips down their back and hangs too far out of the sleeves. 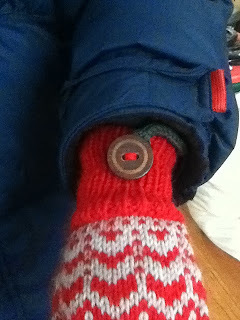 The answer to this is to put the cord through the loop inside the coat (the loop you hang the coat from). But if you've ever tried to slip a mitten through the little loop on the inside of the coat, you'll know that it's impossible. So you have a few options. You could knit the cord and slip it through the loop to keep it in the proper place and then sew the mittens on it later (thus permanently attaching the mittens to that coat unless you want to cut them off of the cord...). You could also knit the cord and attach the mittens, and then tie the middle of the cord to the loop in the coat, but then you have a bulky knot at the child's back and they don't usually like that. Or you could do what I do. Knit a cord and create loops on each end. Then attach buttons to the mittens. 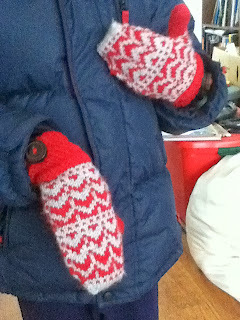 Easily slip the cord through the loop inside the coat and then attach the mittens by putting the buttons in the loops. Whala! He's out the door and his mittens are securely in place. 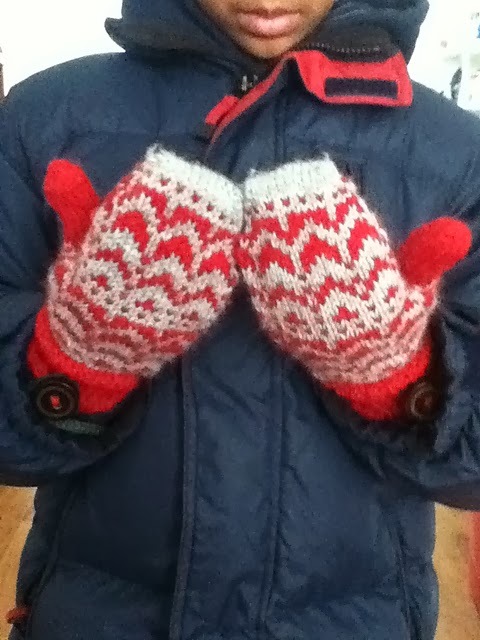 Normally I'd knit a matching red cord bit I was in a pinch this morning so I used the cord from his last set of mittens. No point wasting it. And these buttons were reclaimed buttons that I purchased (3 to a card) from Katrina at one of the various local fiber festivals I've attended. 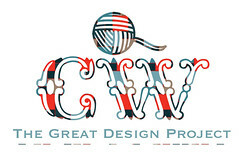 She's got an Etsy shop and makes stunning bamboo buttons that have even been featured in Interweave Magazine (or was it Vogue...you get the idea...it was a big deal). You may recognize her name from when I used her anchor buttons on Alex's red sweater. Now, I'm off to knit a secret baby gift for a friend of the family. Can't wait to show it off.